L. M. Boston, Memory in a House ((New York: Macmillan, 1973), 122-3. I will modify my complaints about the (lack of) effect of RoundUp on creeping bellflower. It depends on how well established the plant is. One thoroughly drenched plant in a crack in the sidewalk is now looking dead as a doornail, and a good thing, too, since I am not going to take a sledgehammer to the path to the garage in order to dig out that plant. I expect it was a relatively recent sprout from seed. Various other patches are still flourishing like the deadly sins, looking green, bushy, and smug. Those, I bet, have huge deep roots that are going to be a bugger to dig up. I have now dug out the patch of bellflower by the clematis. I delayed tackling that because I was reluctant to risk killing the clematis (one purple, one red-violet, both glorious). That was where I started carefully painting the poison onto the leaves of the demon plants. I think I spritzed them twice after that, and they still looked . . . not healthy, but certainly not dead. When I dug, I found that while there were some new, plump, happy roots that had clearly sprouted recently, I was also able to dig out a great quantity of large old roots, many of which seemed rather sickly compared to the roots I dug out of a different bed last year. So the herbicide has some effect, and maybe if I just kept spraying it would eventually do the job. But I don’t trust bellflower not to come back, or develop a resistance, or something. So the digging continues. However, I feel somewhat more optimistic about the possibility that I really will be able to get rid of Campanula rapunculoides. Eventually. I do hope I haven’t killed the clematis. I tried not to hurt it, but a lot of its roots were exposed for awhile, and I broke some. When I finished, I reburied its roots and gave it a drink. If it survives my excavations, I’m sure it will be happier not to be competing for resources with the invading Siberian. I feel like I should update the blog, but nothing much is going on. Still grading, still digging up bellflower, still neglecting research to make time to de-clutter/pack up the house, which is still going very slowly (because grading, commuting, exercising, and gardening all take time), still working on getting Reina and Basement Cat to get along again (okay, sort of, in the living room, not okay in “home territory” like the rooms where each sleeps). Nor do I have any interesting thoughts about topics of the day. I am boring. But at least I can report that everyone in my household is healthy and we have no bad news to deal with. I’ll just be keeping on till the end of the semester comes. Maybe I can find some writing quotes to post for your inspiration, if not for mine. I feel well, the sun is shining, flowers are flowering, birds are twittering, I’ve done a whole lot of stuff today including some things I really didn’t want to and also some things I enjoyed, I found that I forgot to record a substantial deposit some time ago and that’s why the bank thinks we have more money than I thought we should (so no more waiting for something to clear or worrying about mistakes), and there’s still time in the day to get some more useful and enjoyable things done. I’m reading a delightful book, a memoir by L. M. Boston called Perverse and Foolish, which is broken into little chunks that can be enjoyed either in a few minutes between other things or at longer stretches. It looks as if the summer teaching abroad program has enough students to run, and though I have batches of grading to get through they are smaller batches than at the beginning of the term because I “forgot” to point out to students until after spring break that whereas there are five (say) assignments of Type X on the syllabus they only have to do four of them, so now lots of them are breathing sighs of relief and ceasing to turn in work, except for those who want extra credit, and those are usually the better students anyway. We finally got around to watching the Paris-Roubaix bike race and I think it was the most boring Paris-Roubaix I have ever watched but at least it wasn’t heart-breaking; no one was seriously injured. Paris-Roubaix is called “the Hell of the North” and runs over 25-29 cobblestoned sectors that are brutal; when it’s raining or has rained recently it’s incredibly muddy, slippery, and awful, and when it’s dry it’s incredibly dusty, slippery, and awful. When it’s windy the winds can blow the race apart even without the cobblestones. I still remember vividly watching Frank Schleck crash and break his collarbone in three places. Anyway, this year it wasn’t muddy or windy and was only a little dusty and it seemed like everything went very well, and I’m glad no one got badly hurt. Reina is snoozing on a chair and Glendower is dozing in a cat carrier with his head poking out just a little so I can see his tufty ears. It’s nice to have their company. Research . . . well, I should do some. I gave a talk this week that went well but it has just dawned on me that I’m supposed to contribute to my writing group this week so I can’t rest on my laurels. It’s a good thing there’s still some time today! The war on the creeping bellflower continues. Early on, before I identified the stuff, I hired a gardener to help me figure out how to manage the plants that were taking over. Although bishop’s weed is common in gardens around here, and bellflower is, sadly, more common than it ought to be, she didn’t recognize either one. I wish I had recognized this as a bad sign. However, she did have a good eye for design, and a good team for digging, so she was some help. Nonetheless, she had a naive and touching faith in the power of grass and mulch to choke out weeds, and in short order I was digging bishop’s weed and bellflower out of the newly installed sod. Later I joined a local gardening group, hoping that there might be some member with good advice. Hah. “Why are you digging?” they said. “Just use RoundUp,” they said. “It’s resistant to herbicides,” I said, and they scoffed. Well, I am here to tell you that their faith in RoundUp is similarly naive and touching. Last week, I carefully painted it onto the leaves of the bellflower; days later, the weed continued to flourish madly. I said, “OK, no more Ms Nice Gardener,” and spritzed with abandon. The bellflower remains green, healthy, and undaunted, though the herbicide did take care of a few dandelions and similar ordinary weeds in the vicinity. I am really not bothered by dandelions and other such innocent flora. At this point, I am thrilled to see Creeping Charlie spreading in the one bed where I am pretty sure I have eradicated both bellflower and bishop’s weed, because that means that all more serious threats are gone. In all my digging, I killed the iris, but I seem to have succeeded in dissecting the bellflower roots away from the roots of roses and hostas, and I think I salvaged most of the bulbs. But really, if you have bellflower, you would be better off hiring earth-moving equipment to remove all the topsoil, and then start over. I do not know what I am going to do where it has grown around the roots of the oak tree. There are those who do, and those who dream. It has taken much of my life to realize that there are very few things I’d rather do than read about doing. That number keeps shrinking. You might think eating would be a definite Do, but as I am at present on a fairly restricted diet, there are a lot of foods I enjoy only vicariously, by reading about other people’s enjoyment of them. Easy country walks fall into both categories; travel to countries other than those in Europe and North America, however, is strictly Read/Dream. I also love reading about detectives solving murder mysteries, and about Bren Cameron translating for aliens, but I have zero desire to do either, myself. Currently I have tabs open for four gardening blogs, whose archives I am reading with considerable pleasure. And then I look at my own garden, and wonder how much work it needs to make it possible to offload it, along with this house, onto someone else, and how much of that work I’m willing to pay someone else to do. Despite all my efforts, the garden is still afflicted with creeping bellflower and bishop’s weed; various ornamental grasses and flowers that dry to ornamental interest need to be cut back now that it’s spring; the lawn is patchy; the flowerbeds are covered in last year’s leaf mulch, though some bulbs are popping bravely through. The gardening blogs I’m dipping into are almost entirely those of people living in the U.K., with a far kinder climate than U.S. zone whatever I’m in (five? six?). Their “winter garden” pictures are of greenery artistically rimed with frost, at times when my garden is usually under a foot or two of snow. At the end of February, their gardens are farther along than mine is in April, and their idea of a baking summer afternoon is what the thermometer here hits by 10:00 a.m. on a July morning before soaring into temperatures that demand drawn curtains and air conditioning. Possibly in other circumstances, I would be a gardener, as in other circumstances, I might be a number of other things that, either by decision or happenstance, I am not: a mother, an interpreter, an accountant, a superstar scholar, a third-grade teacher. But I think I should pay more attention to what I like to do, and not assume that the things that interest me in print are things I want to do IRL. Gardening is hard on back, hands, fingernails and complexion. I am fair-skinned and not particularly sturdy, in fact in some ways rather fragile. I can see that there must be great creative satisfaction in producing a glorious garden, but it is clear to me that what I like most is reading. I’m just as happy to spend my outdoor time going for walks on which I admire other people’s gardens. I do want some small private place where I can sit outdoors to read on a nice day without being spare-changed or otherwise harassed, as too often happens in parks, but a balcony, patio or front stoop would suit me fine. I ordered a pair of Chaco’s chukka boots (say “Chaco’s chukkas” five times, fast). Astonishingly, they have enough arch support that I don’t need inserts in them. I cannot remember the last time I tried on shoes of which I could say that. And yet I think I am going to send them back. 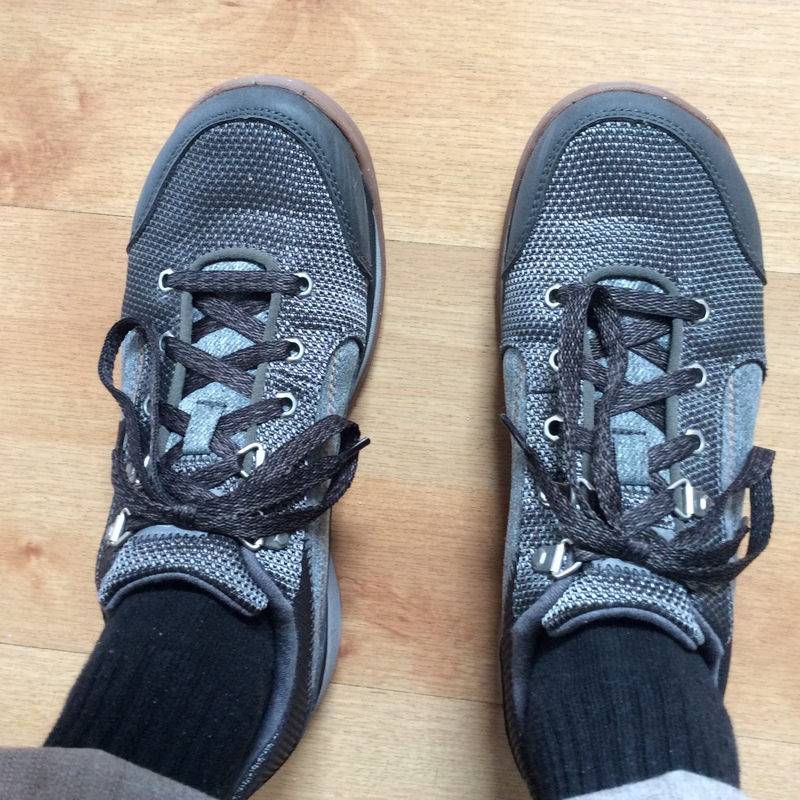 They are noticeably too wide, so that the top of the shoe puckers when I lace them tightly. While they are marginally less sporty than the Kanarra trail walkers, they are still definitely a casual shoe. They look okay with a short, sporty skirt, but then, the Kanarras aren’t too bad with the same skirt. I think I’d be better off putting the money into a pair of Chaco’s sandals for summer, wearing the trail walkers with trousers, and relying on my usual shoes and boots, with inserts, for dressier outfits and occasions. But they are so comfortable that I almost don’t care what they look like. Almost. (Still vain.) Anyway, if Pym Fan or anyone else with feet like mine is interested, the Pineland chukkas are on sale right now. Order a half size down, and enjoy the support. My new shoes are helping both ankles and knees. The hip is still a work in progress, so aches there may have some other cause. Nonetheless, it’s nice to have solved a couple of body problems just by buying new shoes. They are Chaco’s Kanarra, a little wide for me but acceptable with inserts and socks (and a Scarlett O’Hara style pull on the laces). I also bought some high-arch inserts to try in some of my other shoes, but after a try-on, I shrugged and went back to the Chacos. They feel good. Elegant they are not, but they are at least a discreet and sober grey, unlike my gym shoes, which nearly glow in the dark. I just wish I could find a pair of shoes that feels this good and looks acceptable with dresses. I could get a pair of Chaco’s sandals for summer . . .